COSLYS Organic Cleansing Foam "Cosmousse" gently cleanses dry and sensitive skins. Rich in moisturizing organic aloe vera and soothing rose floral water, this face cleanser leaves your skin silky smooth. Convenient and environment-friendly, the Cosmousse refill is perfect to reuse your pump ! 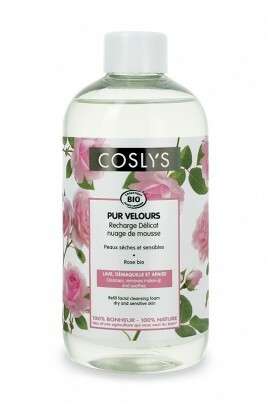 Coslys Refillable Cleansing Foam is environment friendly ! Pour the Refill in your Organic Cosmousse Coslys empty bottle. Apply on wet skin, massage gently and rinse with water. Follow by applying Coslys face cream for dry and sensitive skin.